Your generous, tax deductible donation to Operation Mend will change the lives of our wounded warriors, caregivers, and family members. In addition to the medical and surgical costs associated with their holistic care, Operation Mend provides financial support to cover the costs of transportation to and from our facilities, housing for the patients and their families, meals, as well as any kind of care coordination. Covering these expenses is necessary as many veterans face significant barriers to care. Operation Mend helps veterans deal with logistical challenges including not knowing where to go for treatment, not having enough leave time from work, long distances to travel to a facility and other transportation challenges, difficulty in arranging child care or spousal support, trouble scheduling and coordinating appointments, stigma, and of course the sheer cost of services. Nearly 50% of our wounded warriors do not have basic healthcare insurance. Operation Mend’s Gold Standards of Treatment ensure our nation’s wounded warriors are able access treatment and that they feel welcomed and comfortable from the moment they become a part of our family. With your support we can continue to do just that. 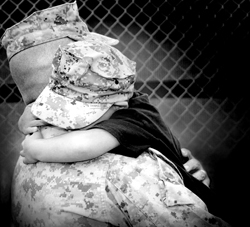 The easiest way to support Operation Mend is through our giving site. Upon receiving your gift, a donation receipt will be emailed to the email address you provided.